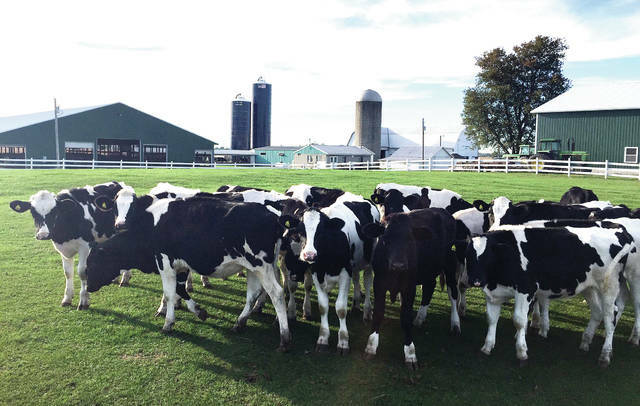 The 2019 Breakfast on the Farm event will be held June 15 at the Henricks and Krieger Dairy in Fayette. The Fulton County agricultural community has announced this year’s Breakfast on the Farm event will be Saturday, June 15, 9 a.m.-1 p.m., at Henricks and Krieger Dairy in Fayette. This free, family-friendly event allows the community to enjoy a free, locally-produced breakfast while having a close-to-home agricultural experience. Participants will enjoy a breakfast featuring an Ohio-grown and produced menu and a self-guided tour at the farm at 14692 County Road 16-3. They will meet the Henricks and Krieger families and learn about bio-security, animal well-being, grain bin safety, water quality, cow nutrition, milk quality and safety, and nutrient management. There will also be children’s activities and the opportunity to interact with commodity groups. Henricks and Krieger Dairy is a third generation, three-family partnership owned by Richard and Sue Henricks, Phillip and Tara Henricks, and Shawn and Kim Krieger. The family farm was founded 72 years ago by Clifford and Annabelle Henricks in Chesterfield Township, located east of Fayette. The family cares for Holstein cows and raises corn, soybeans, alfalfa, and wheat. Henricks and Krieger Dairy is a member of the Ohio and National Holstein Association, the Farm Bureau, and the Fulton County Dairy Association. Fulton County Breakfast on the Farm is coordinated by the Fulton Soil and Water Conservation District, Ohio Farm Bureau Fulton County, and the Fulton County OSU Extension, along with a community-based planning committee. To register, visit www.go.osu.edu/fultonbotfregister2019. Tickets will be printable after web registration. Also register by contacting Fulton Soil and Water Conservation District, Lucas County Soil and Water Conservation District, OSU Extension Fulton County Office, OSU Extension Lucas County Office or the Farm Bureau offices in Pettisville and Woodville.